Finding a full service moving company in Manassas Virginia isn’t as difficult as you might think. Able Moving & Storage has been moving the residents of Manassas for over 30 years and is proud to announce that we were voted “Best Moving Company” in Prince William County by Inside NoVA’s 2017 Best of Prince William. Our services include long distance moving, interstate moving, international moving, house moving, furniture help, storage solutions, free moving quotes, and affordable prices. So whether you need moving help, packing supplies, or just general relocation advice, give our family a call. We’re a company that will cater to your every need. With Able Moving & Storage, exceptional service is the standard we set. Other moving companies in Manassas VA will struggle to keep up with our service just because it requires a lot more effort than people think. Our company has had a long time to get things right! Richard F. says “Able Moving and Storage is terrific!! They did a wonderful job moving some delicate pieces from one house to another and have five crates of furniture in storage waiting for the new house to be built. I can’t say enough about their service – prompt, courteous, and very careful with our valuables. Manassas is full of homes and businesses, many of which will need moving assistance of some kind. There are many moving and/or storage companies in the area, but none with the quality and service of Able. With so many different options for moving companies in the area, picking only one to assist with your relocation can be a task in itself. By doing your due diligence and reading prior reviews, you can almost guarantee you’ll be picking the right moving service. Our Manassas office moving service has helped hundreds of businesses relocate. 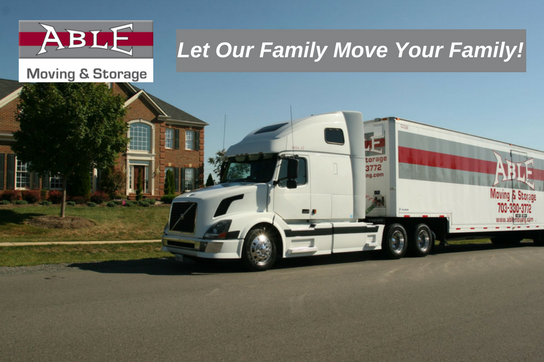 Whether they were moving out of state or across the country, Able Moving & Storage made their move as seamless as possible, and we can do the same for you. Request a quote from our friendly and helpful moving coordinators. Our state of the art trucks are on standby, awaiting the go ahead to retrieve your property. Able Moving & Storage is the perfect long distance moving company in Manassas because of our experience and high standards. We seek to serve our clients better than they could ever expect and we have been doing so successfully for 30 years. With so many successful and completed long distance moves, we can be trusted to transport your belongings with our full service moving options safely. Long distance moving is our specialty, so request a free estimate today and experience what Able can do for your long distance relocation. In addition to our packing & moving services, we offer professional storage services, for both your short term and long term storage needs. If you’re looking for storage in Manassas, we invite you to take a tour of one of our three warehouses, explicitly built for safe keeping of your items. We know there are plenty of storage options in the area, but what makes Able different is we offer top-notch storage help. Over the years, our storage services have built a reputation for being safe, secure, and reliable — and we’re proud of that. Packing can be one of the most time-consuming activities of moving, especially if you own a lot of property. Our packing service is designed to save you time and money by having our expert packers tackle the problem. On average, our packers can neatly pack up a fully furnished room in about an hour and a half. We can provide a more accurate estimate with pricing once one of our estimators can visit your office or residence. Don’t stress over packing, just call Able Moving & Storage! Arguably one of the most important parts of any move is the price. Our moving, storage and packing rates are very affordable, even to those moving on a budget. The first step is to have an estimator visit your home to determine the services you need and the amount of labor it will take to complete. Manassas is home to other moving companies but none quite like Able. We’re a full-service mover with 30 years of experience to back us up. Request your quote here or give us a call! Thousands of families have been relocated with our services; we would be honored to have the chance of our family moving your family. To get the best price possible on your move, we recommend scheduling your move in the middle of the month, in the middle of the week. Having won “Best Moving Company” in Prince William County by Inside NoVA’s 2017 Best of Prince William, we want to thank our amazing customers for voting for us! We couldn’t have done it without you. Winning such an award makes us feel great because it means we are doing something right. Our moving trucks have been seen moving Manassas for the past 30 years. With so much time and experience in the area, Able Moving & Storage is an obvious choice for someone looking for the best moving company. If you’re looking for us, you can find us waiting for your next local, long distance, or international move. Contact us today!